I was inspired to create this dish on a night when the rest of my family were having burger patties (wrapped in lettuce) and I felt like having a burger too. 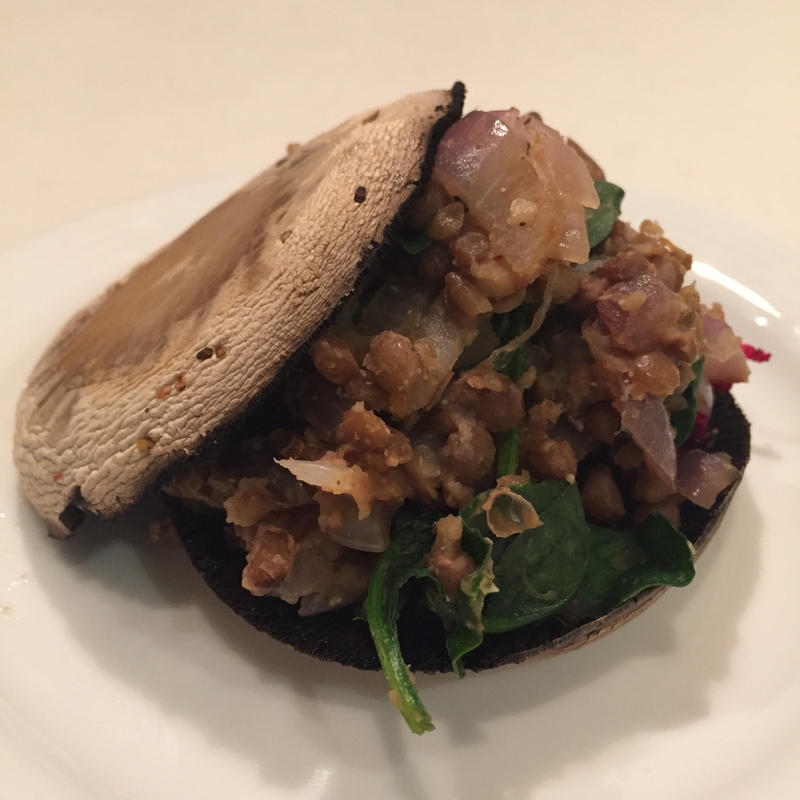 Looking at the field mushrooms I had sitting in the fridge, they resembled the size of a burger bun and therefore would make the perfect burger for me. Wanting to keep it quick and simple, I sauteed some onions, garlic, lentils and spinach, and it resulted in a delicious, nutritious meal! Preheat oven to 180 degrees and line tray with baking paper. Peel mushrooms and remove stem. Place on baking tray and using 1 teaspoon of Mingle Sammy seasoning, sprinkle it over the mushrooms evenly. Place mushrooms in oven and bake for approximately 25 minutes. When the mushrooms are starting to look soft and tender, you know they are ready. Whilst mushrooms are baking, heat your olive oil and add your shallots, sautéing for approximately 5 minutes until they are soft. Add your garlic and stir for 1 minute. Add your lentils and the additional teaspoon of Mingle seasoning. Stir for a couple of minutes until it is all well combined. Add your baby spinach and gently toss it through until the spinach has wilted. Once the mushrooms have finished baking, place 2 on a plate and then fill them with the lentil and spinach filling. This can be served with a side salad or build it up to resemble a burger by placing some grated beetroot, grated carrot and diced avocado on top of the lentil and spinach filling.